The black hole information paradox is a puzzle resulting from the combination of quantum mechanics and general relativity. Calculations suggest that physical information could permanently disappear in a black hole, allowing many physical states to devolve into the same state. This is controversial because it violates a core precept of modern physics—that in principle the value of a wave function of a physical system at one point in time should determine its value at any other time. A fundamental postulate of the Copenhagen interpretation of quantum mechanics is that complete information about a system is encoded in its wave function up to when the wave function collapses. The evolution of the wave function is determined by a unitary operator, and unitarity implies that information is conserved in the quantum sense. Quantum determinism means that given a present wave function, its future changes are uniquely determined by the evolution operator. Reversibility refers to the fact that the evolution operator has an inverse, meaning that the past wave functions are similarly unique. The combination of the two means that information must always be preserved. Starting in the mid-1970s, Stephen Hawking and Jacob Bekenstein put forward theoretical arguments based on general relativity and quantum field theory that not only appeared to be inconsistent with information conservation but which did not account for the information loss and which stated no reason for it. Specifically, Hawking's calculations indicated that black hole evaporation via Hawking radiation does not preserve information. Today, many physicists believe that the holographic principle (specifically the AdS/CFT duality) demonstrates that Hawking's conclusion was incorrect, and that information is in fact preserved. In 2004 Hawking himself conceded a bet he had made, agreeing that black hole evaporation does in fact preserve information. The Penrose diagram of a black hole which forms, and then completely evaporates away. Information falling into it will hit the singularity. [clarification needed] Time shown on vertical axis from bottom to top; space shown on horizontal axis from left (radius zero) to right (growing radius). In 1973–75, Stephen Hawking and Jacob Bekenstein showed that black holes should slowly radiate away energy, which poses a problem. From the no-hair theorem, one would expect the Hawking radiation to be completely independent of the material entering the black hole. 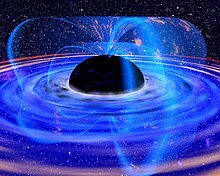 Nevertheless, if the material entering the black hole were a pure quantum state, the transformation of that state into the mixed state of Hawking radiation would destroy information about the original quantum state. This violates Liouville's theorem and presents a physical paradox. More precisely, if there is an entangled pure state, and one part of the entangled system is thrown into the black hole while keeping the other part outside, the result is a mixed state after the partial trace is taken into the interior of the black hole. But since everything within the interior of the black hole will hit the singularity within a finite time, the part which is traced over partially might disappear completely from the physical system. Hawking remained convinced that the equations of black-hole thermodynamics, together with the no-hair theorem, led to the conclusion that quantum information may be destroyed. This annoyed many physicists, notably John Preskill, who bet Hawking and Kip Thorne in 1997 that information was not lost in black holes. The implications that Hawking had opened led to a "battle" where Leonard Susskind and Gerard 't Hooft publicly 'declared war' on Hawking's solution, with Susskind publishing a popular book, The Black Hole War, about the debate in 2008. (The book carefully notes that the 'war' was purely a scientific one, and that at a personal level, the participants remained friends.) The solution to the problem that concluded the battle is the holographic principle, which was first proposed by 't Hooft but was given a precise string theory interpretation by Susskind. With this, "Susskind quashes Hawking in quarrel over quantum quandary". There are various ideas about how the paradox is solved. Since the 1997 proposal of the AdS/CFT correspondence, the predominant belief among physicists is that information is preserved and that Hawking radiation is not precisely thermal but receives quantum corrections. [clarification needed] Other possibilities include the information being contained in a Planckian remnant left over at the end of Hawking radiation or a modification of the laws of quantum mechanics to allow for non-unitary time evolution. In July 2004, Stephen Hawking published a paper presenting a theory that quantum perturbations of the event horizon could allow information to escape from a black hole, which would resolve the information paradox. His argument assumes the unitarity of the AdS/CFT correspondence which implies that an AdS black hole that is dual to a thermal conformal field theory. When announcing his result, Hawking also conceded the 1997 bet, paying Preskill with a baseball encyclopedia "from which information can be retrieved at will." Advantage: Seems to be a direct consequence of relatively non-controversial calculation based on semiclassical gravity. Advantage: Intuitively appealing because it qualitatively resembles information recovery in a classical process of burning. Disadvantage: Requires a large deviation from classical and semiclassical gravity (which do not allow information to leak out from the black hole) even for macroscopic black holes for which classical and semiclassical approximations are expected to be good approximations. Advantage: A significant deviation from classical and semiclassical gravity is needed only in the regime in which the effects of quantum gravity are expected to dominate. Disadvantage: Just before the sudden escape of information, a very small black hole must be able to store an arbitrary amount of information, which violates the Bekenstein bound. Advantage: No mechanism for information escape is needed. Disadvantage: To contain the information from any evaporated black hole, the remnants would need to have an infinite number of internal states. It has been argued that it would be possible to produce an infinite amount of pairs of these remnants since they are small and indistinguishable from the perspective of the low-energy effective theory. Advantage: The size of remnant increases with the size of the initial black hole, so there is no need for an infinite number of internal states. Disadvantage: Hawking radiation must stop before the black hole reaches the Planck size, which requires a violation of semi-classical gravity at a macroscopic scale. Information is stored in a baby universe that separates from our own universe. Advantage: This scenario is predicted by the Einstein–Cartan theory of gravity which extends general relativity to matter with intrinsic angular momentum (spin). No violation of known general principles of physics is needed. Disadvantage: It is difficult to test the Einstein–Cartan theory because its predictions are significantly different from general-relativistic ones only at extremely high densities. Advantage: Semiclassical gravity is sufficient, i.e., the solution does not depend on details of (still not well understood) quantum gravity. Disadvantage: Contradicts the intuitive view of nature as an entity that evolves with time. In 2014, Chris Adami argued that analysis using quantum channel theory causes any apparent paradox to disappear; Adami rejects Susskind's analysis of black hole complementarity, arguing instead that no space-like surface contains duplicated quantum information. In 2015, Modak, Ortíz, Peña and Sudarsky, have argued that the paradox can be dissolved by invoking foundational issues of quantum theory often referred as the measurement problem of quantum mechanics. This work was built on an earlier proposal by Okon and Sudarsky on the benefits of objective collapse theory in a much broader context. The original motivation of these studies was the long lasting proposal of Roger Penrose where collapse of the wave-function is said to be inevitable in presence of black holes (and even under the influence of gravitational field). Experimental verification of collapse theories is an ongoing effort. In 2016, Hawking et al. proposed new theories of information moving in and out of a black hole. The 2016 work posits that the information is saved in "soft particles", low-energy versions of photons and other particles that exist in zero-energy empty space. ^ The short form "ínformation paradox" is also used for the Arrow information paradox. ^ Hawking, Stephen (2006). The Hawking Paradox. Discovery Channel. Archived from the original on 2 August 2013. Retrieved 13 August 2013. ^ Overbye, Dennis (12 August 2013). "A Black Hole Mystery Wrapped in a Firewall Paradox". The New York Times. Retrieved 12 August 2013. ^ Hawking, Stephen (1 August 1975). "Particle Creation by Black Holes". Commun. Math. Phys. 43 (3): 199–220. Bibcode:1975CMaPh..43..199H. doi:10.1007/BF02345020. ^ Barbón, J. L. F. "Black holes, information and holography" J. Phys. : Conf. Ser. 171 01 (2009) doi:10.1088/1742-6596/171/1/012009 http://iopscience.iop.org/1742-6596/171/1/012009 p.1: "The most important departure from conventional thinking in recent years, the holographic principle...provides a definition of quantum gravity...[and] guarantees that the whole process is unitary." ^ Susskind, Leonard (2008-07-07). The Black Hole War: My Battle with Stephen Hawking to Make the World Safe for Quantum Mechanics. Little, Brown. p. 10. ISBN 9780316032698. Retrieved 2015-04-07. It was not a war between angry enemies; indeed the main participants are all friends. But it was a fierce intellectual struggle of ideas between people who deeply respected each other but also profoundly disagreed. ^ "Susskind Quashes Hawking in Quarrel Over Quantum Quandary". CALIFORNIA LITERARY REVIEW. 2008-07-09. Archived from the original on 2012-04-02. ^ Baez, John. "This Week's Finds in Mathematical Physics (Week 207)". Retrieved 2011-09-25. ^ Gurzadyan, V. G.; Penrose, R. (2010). "Concentric circles in WMAP data may provide evidence of violent pre-Big-Bang activity". arXiv:1011.3706 [astro-ph.CO]. ^ Wehus, I. K.; Eriksen, H. K. (2010). "A search for concentric circles in the 7-year WMAP temperature sky maps". The Astrophysical Journal. 733 (2): L29. arXiv:1012.1268. doi:10.1088/2041-8205/733/2/L29. ^ Moss, A.; Scott, D.; Zibin, J. P. (2010). "No evidence for anomalously low variance circles on the sky". Journal of Cosmology and Astroparticle Physics. 2011 (4): 033. arXiv:1012.1305. doi:10.1088/1475-7516/2011/04/033. ^ Hajian, A. (2010). "Are There Echoes From The Pre-Big Bang Universe? A Search for Low Variance Circles in the CMB Sky". The Astrophysical Journal. 740 (2): 52. arXiv:1012.1656. doi:10.1088/0004-637X/740/2/52. ^ Eriksen, H. K.; Wehus, I. K. (2010). "Comment on "CCC-predicted low-variance circles in CMB sky and LCDM"". arXiv:1105.1081 [astro-ph.CO]. ^ a b c d Giddings, Steven B. (1995). "The black hole information paradox". Particles, Strings and Cosmology. Johns Hopkins Workshop on Current Problems in Particle Theory 19 and the PASCOS Interdisciplinary Symposium 5. arXiv:hep-th/9508151. Bibcode:1995hep.th....8151G. ^ a b c d e Preskill, John (1992). Do Black Holes Destroy Information?. International Symposium on Black Holes, Membranes, Wormholes, and Superstrings. arXiv:hep-th/9209058. Bibcode:1993bhmw.conf...22P. ^ Nikolic, Hrvoje (2015). "Violation of unitarity by Hawking radiation does not violate energy-momentum conservation". Journal of Cosmology and Astroparticle Physics. 04 (4): 002. arXiv:1502.04324. Bibcode:2015JCAP...04..002N. doi:10.1088/1475-7516/2015/04/002. ^ Giddings, Steven B. (1998). "Comments on information loss and remnants". Physical Review D. 49 (8): 4078–4088. arXiv:hep-th/9310101. Bibcode:1994PhRvD..49.4078G. doi:10.1103/PhysRevD.49.4078. ^ Giddings, Steven (1992). "Black Holes and Massive Remnants". Physical Review D. 46 (4): 1347–1352. arXiv:hep-th/9203059. Bibcode:1992PhRvD..46.1347G. doi:10.1103/PhysRevD.46.1347. ^ Nikolic, Hrvoje (2015). "Gravitational crystal inside the black hole". Modern Physics Letters A. 30 (37): 1550201. arXiv:1505.04088. Bibcode:2015MPLA...3050201N. doi:10.1142/S0217732315502016. ^ Nikodem J. Popławski (2010). "Cosmology with torsion: An alternative to cosmic inflation". Physics Letters B. 694 (3): 181–185. arXiv:1007.0587. Bibcode:2010PhLB..694..181P. doi:10.1016/j.physletb.2010.09.056. ^ Hartle, James B. (1998). "Generalized Quantum Theory in Evaporating Black Hole Spacetimes". Black Holes and Relativistic Stars: 195. arXiv:gr-qc/9705022. Bibcode:1998bhrs.conf..195H. ^ Nikolic, Hrvoje (2009). "Resolving the black-hole information paradox by treating time on an equal footing with space". Physics Letters B. 678 (2): 218–221. arXiv:0905.0538. Bibcode:2009PhLB..678..218N. doi:10.1016/j.physletb.2009.06.029. ^ Bradler, Kamil; Adami, Christoph (2014). "The capacity of black holes to transmit quantum information". Journal of High Energy Physics. 2014 (5): 95. arXiv:1310.7914. Bibcode:2014JHEP...05..095B. doi:10.1007/JHEP05(2014)095. ISSN 1029-8479. ^ Gyongyosi, Laszlo (2014). "A statistical model of information evaporation of perfectly reflecting black holes". International Journal of Quantum Information. 12 (7n08): 1560025. arXiv:1311.3598. Bibcode:2014IJQI...1260025G. doi:10.1142/s0219749915600254. ^ Modak, Sujoy K.; Ortíz, Leonardo; Peña, Igor; Sudarsky, Daniel (2015). "Black hole evaporation: information loss but no paradox". General Relativity and Gravitation. 47 (10): 120. arXiv:1406.4898. Bibcode:2015GReGr..47..120M. doi:10.1007/s10714-015-1960-y. ISSN 1572-9532. ^ Okon, Elias; Sudarsky, Daniel (2014). "Benefits of Objective Collapse Models for Cosmology and Quantum Gravity". Foundations of Physics. 44 (2): 114–143. arXiv:1309.1730. Bibcode:2014FoPh...44..114O. doi:10.1007/s10701-014-9772-6. ISSN 1572-9516. ^ Penrose, Roger (1989). "Newton, quantum theory and reality". Three Hundred Years of Gravitation. Cambridge University Press. p. 17. ISBN 9780521379762. ^ Penrose, Roger (1996). "On Gravity's role in Quantum State Reduction". General Relativity and Gravitation. 28 (5): 581–600. Bibcode:1996GReGr..28..581P. CiteSeerX 10.1.1.468.2731. doi:10.1007/BF02105068. ISSN 1572-9532. ^ Bassi et.al., Angelo (2013). "Models of wave-function collapse, underlying theories, and experimental tests". Rev. Mod. Phys. 85 (2): 471–527. arXiv:1204.4325. Bibcode:2013RvMP...85..471B. doi:10.1103/RevModPhys.85.471. ISSN 1539-0756. ^ "Stephen Hawking's New Black-Hole Paper, Translated: An Interview with Co-Author Andrew Strominger". Scientific American Blog Network. Retrieved 2016-01-09. ^ Hawking, Stephen W.; Perry, Malcolm J.; Strominger, Andrew (2016-01-05). "Soft Hair on Black Holes". Physical Review Letters. 116 (23): 231301. arXiv:1601.00921. Bibcode:2016PhRvL.116w1301H. doi:10.1103/PhysRevLett.116.231301. PMID 27341223. ^ magazine, Davide Castelvecchi,Nature. "Hawking's Latest Black Hole Paper Splits Physicists". Scientific American. Retrieved 2016-01-27. Preskill, John (1992). "Do black holes destroy information?". An International Symposium on Black Holes: 22. arXiv:hep-th/9209058. Bibcode:1993bhmw.conf...22P . Discusses methods of attack on the problem, and their apparent shortcomings. Hawking, S. W. (July 2005), Information Loss in Black Holes, arxiv:hep-th/0507171. Stephen Hawking's purported solution to the black hole unitarity paradox.